Nulltica Ransomware is a computer infection that is aimed at locking you out of your data and obtaining your money. The truth is that this ransomware infection does not encrypt files as intended, but that does not mean that you should keep the infection on the PC. The Nulltica Ransomware should be removed from the computer before it gets recovered or renewed to encrypt your files. The Nulltica Ransomware is malware built using Hidden Tear, which is a platform enabling almost everyone with some basic skills in coding to launch a ransomware campaign. The server of the Nulltica infection is shut down, and only the creators of the infection can tell whether this infection will ever work. The analysis of Nulltica has shown that this threat would be rather dangerous due to its characteristics identified. For example, Nulltica has some features that are usually detected in keyloggers, which record keyboard input. Such infections are very harmful because they allow cyber criminals to get access to your online accounts to which you log in by typing in your username and password. Additionally, the Nulltica ransomware would also be capable of stealing information from your Facebook account and spreading it through the same network. You should keep in mind that there are quite a few infections that are spread through Facebook by deceiving users into a allowing third-party software to access their profile information. It has been found that the data collected from Facebook accounts by the Nulltica Ransomware would be stored in the log.txt file. These features are not new to malware researchers; there are many different threats that steal and spread valuable personal information. You should take all preventative measures to protect yourself if you do not want to suffer from serious damage. The ransomware is programmed to create its copy in the %APPDATA% directory and a point of execution in the Registry. That means that the infection would launch every time the system starts up. Once installed, the infection would encrypt files and display a ransom warning with detailed instructions how to regain access to the files. The procedure is again not new to researchers. The attackers want to get the ransom in Bitcoin, which is an online currency handled by everyone without any central issuer. In order to have the files decrypted, the victim is expected to pay a $50 ransom in bitcoins, which is approximately 0.02 BTC. The victim is asked to create a digital wallet and send the money to the address given. Since the Nulltica Ransomware is not capable of encrypting files, there is no need to make any payment. More important, it is highly advisable to ignore the requirement to pay a release fee because nobody can guarantee that you will get the change to restore your files. 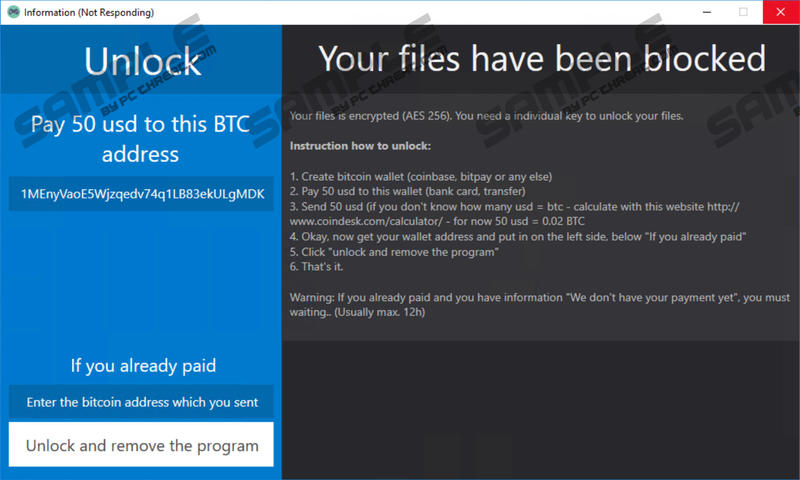 Additionally, the deceptive warning of the Nulltica Ransomware claims that your files have been encrypted using AES-256 encryption, which is a commonly used type of data encoding. In order to prevent malware, including ransomware, attacks, it is crucial to make your file copies from time to time to a separate device. It is also important to take other measures to prevent malware attacks. You should avoid visiting freeware sharing websites and networks, installing unknown software, opening questionable emails, and connecting to unprotected Wi-Fi networks. On top of that, you should always keep the OS protected against malware by a security tool. Every time you access a new website you cannot measure how safe it is, so it is worth considering taking some extra security measures before you have to deal with malware removal and other security issues. Our team is ready to help you with malware removal. Below you will find a removal guide that should help you remove the Nulltica Ransomware from the computer. If you feel that some assistance or advice is necessary, feel free to leave a comment below or install our recommended security program that will remove Nulltica for you in no time. Check the desktop and Downloads folder for questionable files and delete if any are present. Access the %APPDATA% directory and delete the copy of the ransomware. Go the Windows Registry and access a randomly named registry value by following the path HKCU\Software\Microsoft\Windows\CurrentVersion\Run. Delete the entry related to the infection. Quick & tested solution for Nulltica Ransomware removal.